Cancellations must to be done within 48 hours in advance, otherwise the full amount of the booking will be charged. The reservation has to be done via email and the payment will be agreed between the property and the group. 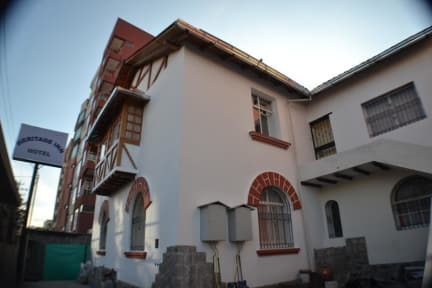 It is a colonial house entirely renovated for your comfort. A cozy and familiar atmosphere is given by all the staff that will try to solve any situation you have. We have a lot of experience in the tourism industry so your safe and nice stay will e guaranteed. In La Mariscal, the main tourist area in Quito, most bars, restaurants, banks, supermarkets, travel agencies are here. Very close to Plaza Foch but far enough for a quiet night. Close to universities Politecnica Nacional, Salesiana, Catolica, UDLA, Simon Bolivar, Central. El Ejido park, Casa de la Cultura (museums, theaters, etc), Embassies (France, Spain, Holland, etc), Coliseo Gral Rumiñahui, Hospitals, the Old Town. Hotels: Swissotel, Radisson, Hitlon, Quito, etc, all within walking distance! Included on the price, we provide the following: a huge breakfast, Internet and WiFi, all rooms with private bathroom, flat screen TVs with Cable TV and English and Spanish channels, towels, linen, soap and shampoo, daily service to the room, maps of the city, tour desk/information, English speaking staff, no curfew, guest kitchen, luggage storage. 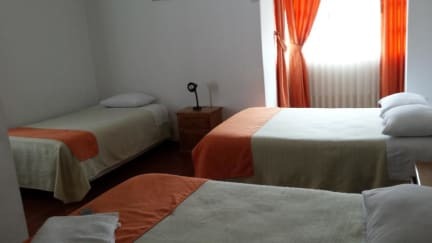 Besides, we offer: laundry service, Spanish lessons, mini bar, bike rental, pay phone, tours on offer, shuttle service, we have regular events with the guests such as traditional meals, meetings, contests, games, etc. A guest once told me: no matter where you go and what you find, is people what makes your trip, and I believe that is true, that is why we make a big effort in order to please every guest, so come and stay with us and you will certainly have the trip of your life! Come and enjoy the wonderful experience of visiting the best Country of the World! We accept any credit card payments only via PayPal with a surcharge.. We do not accept travelers checks. We accept only US dollars for cash payments, with no surcharge. Nice hotel, could be a bit cheaper for what it offers.